Christine Connelly, an occupational therapy pro at a New York City oncology hospital, went looking for adventure on fitness getaways to Bali and Todos Santos, Mexico. But she found something much rarer than amazing Instagram photos: a healthier relationship with food. Here, she shares her story of going from counting calories to creating a whole new life. When I stepped off the airplane in Bali in 2011, I was ready for transformation. Yes, Elizabeth Gilbert eat-pray-loved me to Bali—and it was the farthest I had ever traveled, in more ways than one. Little did I know how I would be pushed physically, emotionally, and spiritually in such a small amount of time, as part of an Escape to Shape fitness getaway, which combines yoga, Pilates, hiking, and more, with top instructors, nutrition experts and coaches there to help you every step of the way—and with daily excursions like snorkeling and surfing to always keep you moving and having fun. My goal was to travel and experience a totally different culture—and most of all, hit the reset button on my life. But what did that mean exactly? At the time, when I thought about transformation—about the person I wanted to be—I imagined her in terms of how she looked. She would weigh a certain amount, her clothes would fit in a certain way, and then she would be happy. This was the first time in my life I wasn’t constantly fixated on losing weight. While my fitness level definitely improved during the trips, I came away with something much more valuable: This was the first time in my life I wasn’t constantly fixated on losing weight. After all, what good is dropping 20 pounds if I’m going back to the same patterns afterward? (Basically: postponing my life until I hit goal weight, then spending my time at goal weight worrying about gaining it back.) I realized it didn’t have to be this way. How did I broaden my idea of “transformation” beyond the scale? Here are some of the lessons I brought home from my beach travels, along with some new passport stamps. I was never enticed to travel by myself, but Escape to Shape allowed me the opportunity to carve out some much-needed alone time while still having the option to interact with interesting and like-minded travelers. A very good friend did join me for the Bali retreat, but I headed to Indonesia several days ahead—the first time I’d ever traveled that far by myself. The resort where we were staying was inspired by a Balinese village, with eco-chic cottages and gorgeous, manicured grounds—and I was lucky enough to be there for the Hindu new year, called Nyepi Day. The whole country stays indoors and observes this day of silence after purging all of their sins during ceremonial processions on the previous night. You’re not even allowed to leave your home, drive vehicles, or be out in the streets on this day—the belief is that the sins and demons that have been released will re-enter your soul. So it was a day of silence in a faraway land—not at all what I would have ever chosen as a vacation before. But having the experience of spending a day dedicated to reflection and contemplation is what really helped me to first find my reset button. Journaling was something I took seriously and did on these trips—being confronted with a blank page at the start of every day helped me to realize that my story was not already written. 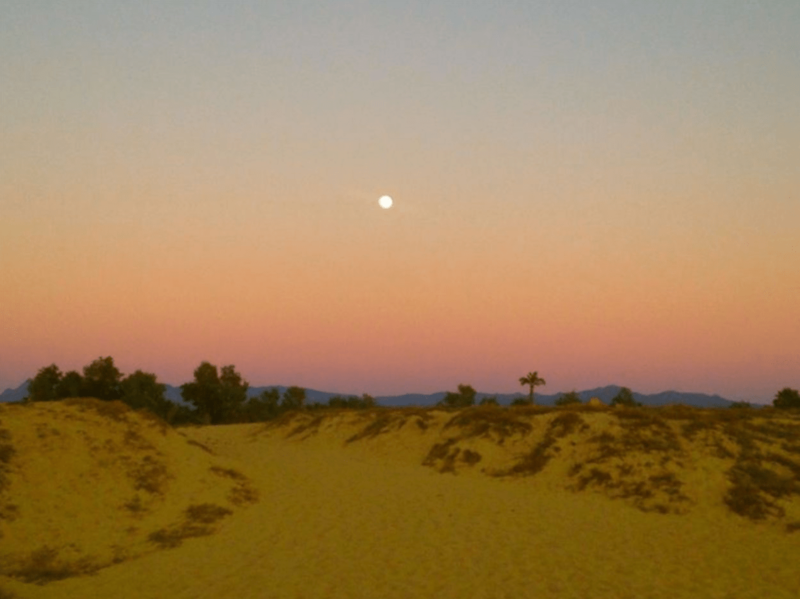 The life coach on the Todos Santos trip in 2014 helped me recognize the triggers that caused me to spiral into making poor choices, and cause me to feel not so great about myself. I started being able to differentiate between physical outcomes (of hitting whatever “goal weight” I was always obsessed with) vs. the intrinsically good feeling that I got from making better decisions. I also began to absolve myself of guilt and let go of the feeling that I could negate any good I had done with one poor choice. That blank page of each new journal entry is a metaphor and a mental image that still resets me when old habits sneak in. I first started out on these trips thinking of the physical outcomes I wanted—fitting into a size 8 dress or being able to do a chaturanga without dropping to my knees. But the super supportive instructors, nutritionists, and life coaches on the trips helped me go beyond that. Before Bali, I was not much of a yogi—I’d taken some classes, but nothing really formal—so I was a bit intimidated. But there was this acceptance of everyone, wherever they were, and real encouragement to push yourself. By seeing what my body could do, I began to see that I was an empowered person who had control, and could make choices to honor my body. Not only did I lose weight without having to think about calories for the first time in my life, I also became the person I missed being. And that person is not defined by a number on the scale. I had traveled in college—going to Europe and backpacking—but the Bali trip was a new frontier for me. The experience inspired me to continue traveling (to Peru, Croatia, and Australia—and soon, to Cuba). The biggest gift I left Bali with, and even more profoundly after Todos Santos, was a newfound sense of confidence and the feeling of peace that I could actually be the person I wanted be. I had to find a way to be able to incorporate what I used to think of as “bad” things. I love sweets, I love hamburgers, and I love a cocktail. To have a relationship where those are considered “bad” choices only sets you up for failure: Well, this was a terrible day so I might as well have that second or third slice of pizza and then ice cream. Now my balance is 80-20, where clean and raw foods, vegetables and fruits, fish, nuts, and afresh green juice every morning make up 80 percent of my diet. And the other 20 percent of the time, I’ll have the burger I want at a beach barbecue, that Mr. Softee ice cream cone after dinner, or after-work drinks with my friends. I am over denying myself this—or even worse, beating myself up for having it. When that happens, the balance can easily flip to 20-80. Now, if there is a day or week when that happens to occur, I know I can start the next day with a blank page. But the point is: I’ve stopped trying to label food as “good” or “bad”—and that subtle shift that I learned on the beaches of Bali and Todos Santos has transformed my life. My travels allowed me to escape New York City, but more importantly, they helped me discover a brand-new life, right here at home.